The traditional analysis of dipmeters makes use of patterns seen on the arrow plot, augmented by those seen on azimuth frequency plots. 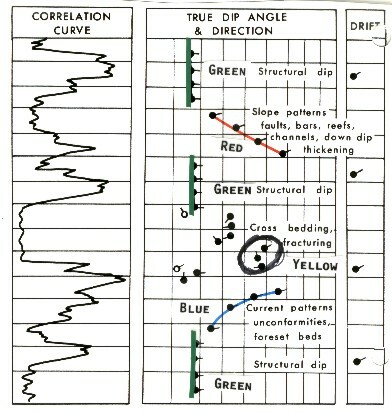 GREEN PATTERNS: nearly constant dip and direction, representing regional dip, sometimes called structural dip. RED PATTERNS: increasing dip with depth, representing drape, down dip thickening, differential compaction, drag on faults, or folding. 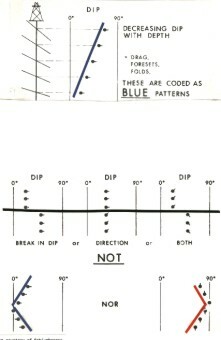 BLUE PATTERNS: decreasing dip with depth, representing drag on faults or folding. BLACK PATTERNS: abrupt change in dip and/or direction, representing unconformities, fault planes, or erosional boundaries between stratigraphic units. CIRCLED PATTERNS or YELLOW PATTERNS: random dip angles or directions indicates bad hole conditions, contorted bedding, fractures, slumping, or brecchia, sometimes associated with fault planes. The color assignments, namely green, red, blue, black, and yellow, are purely arbitrary but have become an industry standard by common usage. Appropriately colored pencils or ink markers are used to join dip arrows to emphasize the patterns. The five patterns are illustrated schematically above. The features associated with each pattern are listed on the illustrations. All but black patterns should have roughly constant dip direction, or else they are not real patterns. An exception is a pattern that passes through zero or ninety degrees, where dip direction will reverse. To begin analysis, start at the top of the log (or somewhere above the zone of interest) and draw in the green, red, blue, black. and yellow patterns, in the order listed. Be careful not to cross a major change in dip direction with one of these patterns, unless it is an exception as described above. Remember that such a change in direction is normally a black pattern. Join arrows which are fairly close in depth. The end of a blue pattern can be the beginning of a red pattern and vice versa. Not all the results need to be included in every pattern. You may decide some are due to noise, rough hole, or minor stratigraphic events embedded in a larger structure. In the example below, the top half of the log shows a trend of dips at 9 degrees downward to the east - a GREEN pattern. The horizontal line at "A" indicates a break in trend - a BLACK pattern. 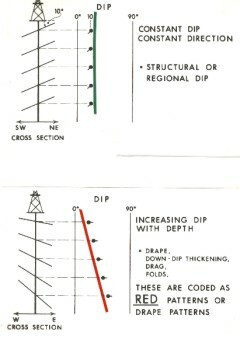 This is followed by another GREEN pattern, indicating regional dip of 5 degrees to the west south west below an unconformity at depth "A". This is followed by a RED pattern indicating drag above a fault. The fault plane is at or slightly above point "C". This is followed by the reverse drag on the down thrown block - a BLUE pattern, lying above another unconformity at point "D". Although we have described a plausible interpretation in the above description, it may not be the only interpretation. However, it is not necessary or even practical to analyze the meaning of all the patterns at this stage - more than one interpretation is possible for all patterns. For example, the event at "C" could be a stratigraphic feature or another unconformity. We need to look at the open hole logs and other well data. 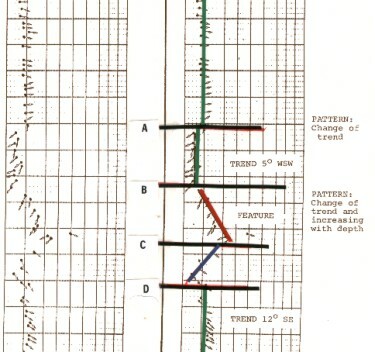 For structural interpretation, you may have to ignore stratigraphic dips. This involves drawing the patterns through dissenting dips in the sandstone layers. This is called macro-colouring as opposed to micro-colouring, used in stratigraphic analysis. 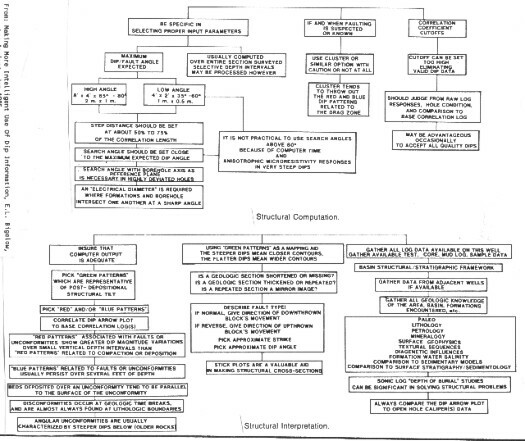 For stratigraphic work, do not join points across a dissenting dip. The dissenting dips are the clues to stratigraphic changes. Join arrows of about the same dip direction. The greater the dip magnitude, the more similar the azimuths should be. 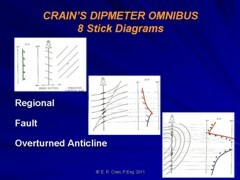 Conversely, when very small dips are considered, the azimuth can vary up to 90 degrees. Keep the scale of features in mind. Structural features may encompass hundreds or thousands of feet of data. Stratigraphic features may be superimposed on the structural patterns, and encompass only a few feet to a few hundred feet. However, drape over reefs and differential compaction may persist over several thousand feet, and these features are associated with stratigraphic traps. Red patterns associated with faults and unconformities tend to show greater variations in dip magnitude over smaller vertical intervals. Blue patterns associated with sedimentary structures are usually short (up to a few feet on the vertical scale), whereas the patterns that are a reflection of faults and unconformities generally persist over much longer intervals.